A lively audience enjoyed the opening night of the Irish-American Crossroads Festival, an unforgettable night of Irish musical performance to benefit the Irish-American Crossroads Festival and the Irish Oral & Video History Archive of the San Francisco Bay Area. Crossroads was honored to host a rare house concert featuring the celebrated musician and historian, Mick Moloney, and internationally renowned fiddler, Athena Tergis as they brought to life the Irish tradition of storytelling through song. Hosted at a beautiful home in San Francisco, guests were treated to breathtaking views, hors d’oeurves, and wines graciously offered from the host’s own wine cellar. The proceeds from this special night of music directly went to support the ongoing work of the Irish-American Crossroads Festival and the Crossroads Irish Oral History Archive of the SF Bay Area. The 9th Annual Irish-American Crossroads Festival was proud to present Mick Moloney, New York University Professor of Music and Irish Studies along with world-renowned fiddler, Athena Tergis, in an exploration of the historical intersection between Irish and Jewish musical traditions entitled, If It Wasn’t for the Irish and the Jews. Audiences enjoyed an illustrative presentation and musical performance documenting this collaboration from 1880 to 1920, a time when Vaudeville and Tin Pan Alley flourished with the fertile contributions of Irish and Jewish songwriters, theatrical producers, and music publishers. Taking its title and inspiration from a catchy song composed in 1912 by William Jerome (real name: William Flannery) and Jean Schwartzis, this performance brought to life former Broadway luminaries such as George M. Cohan (Irish ancestral surname: Keohane), Eddie Foy (born: Edwin Fitzgerald), Norah Bayes (born Norah Goldberg), Tony Hart, Ed Harrigan, and Ada Jones. All of these musical figures populated Dr. Moloney’s presentation about the nimble wit, socioeconomic observation, exuberant rhythms, melodic charm, and sentimental appeal pulsing through this under-appreciated chapter of American musical history. 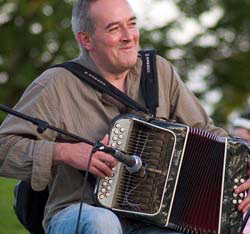 Mick Moloney holds a Ph.D. in folklore and folklife from the University of Pennsylvania. He has taught ethnomusicology, folklore and Irish studies courses at the University of Pennsylvania, Georgetown, and Villanova Universities, and currently teaches at New York University in the Irish Studies program. Athena Tergis hails from San Francisco where she released her first album at age 16. Shortly after she moved to Ireland to follow her musical passions where she lived for over 3 years playing with groups such as the Sharon Shannon Band. In 2001 Athena joined up with Mick Moloney, John Doyle and Billy McComiskey in The Green Fields of America playing Traditional Irish tunes and songs at their best while exploring the music’s journey to America Her most recent Album, A Letter Home, is an album that ranges across the intersections of Irish and Scottish music with an instrumental voice and style informed by the fiddler’s American experiences. This event was made possible, in part, by a grant from Culture Ireland and was presented in association with Eugene & Elinor Friend Center for the Arts at the Jewish Community Center of San Francisco. Crossroads partnered with Off Broadway West Theatre Company to present a dramatic reading of Beggars in the House of Plenty, by Pulitzer-Prize winning playwright John Patrick Shanley. With its second offering in our play reading series, San Francisco’s own Off Broadway West Theatre Company presented Beggars in the House of Plenty by John Patrick Shanley. “In his most autobiographical work to date, John Patrick Shanley takes on the demons and angels of the past that are never quite put to rest because they are family. Fast-paced, furious and unrelenting, this highly stylized play explores the myths and reality of an Irish-American family at war with itself. ‘…crackles with the energy of artists who are going places…a theatrical event not likely to recur anytime soon…In a breathless 90 minutes, 40 topsy-turvy years of family life flood across the stage.’ —NY Times. The Meridian Gallery exhibited the work of Patrick Graham, one of Ireland’s most important contemporary artists. Crossroads is pleased to partner with the Meridian Gallery to explore and celebrate this exhibit through a series of events at the gallery. Kenneth Baker, art critic for the San Francisco Chronicle, is our first guest in this series. Mr. Baker will lead an exploratory presentation about Patrick Graham’s art work, placing the artist both in a cultural and artistic context. A native of the Boston area, Mr. Baker has served as art critic for the Boston Phoenix and has contributed to numerous publications, including Artforum, Art in America and the New York Times Book Review. Mr. Baker has also authored Minimalism: Art of Circumstance (Abbeville Press, 1989/1997). Brothers Sean and Pat O’Donnell entertained while playing lively tunes on fiddle and accordion. Also, San Francisco’s own Celtic Voices Children’s Choir, a community outreach program of the Irish Immigration Pastoral Center (IIPC) performed beautiful songs. Throughout their childhoods, Patrick and Seán O’Donnell had the opportunity to attend many house parties and céilithe with their parents who were both competent set dancers. These occasions provided a chance for the boys to hear traditional music played in the old style by Bay Area musicians who played with and learned from the great Galway accordionists Joe Cooley and Kevin Keegan. Over the past 5 years, the O’Donnell brothers have performed at various events and venues such as the Fairfax Feis, the San Francisco St. Patrick’s Day Parade, at the National Press Club in Washington D.C. and at numerous ceili dances and seisiuns. Both brothers have also won titles at the Midwest Fleadh Cheoil. Audiences enjoyed an engaging conversation about the enduring impact of Irish-Americans in popular culture featuring Joseph McBride, Associate Professor in the Cinema Department, San Francisco State University, Terry Golway, Professor of History, Kean University and Irish Echo columnist, and James Silas Rogers, director of Irish Studies at the University of St. Thomas in Minnesota. This panel was moderated by Bay Area poet, Jack Foley with a performance by Jack & Adelle Foley. Terry Golway is the director of the Kean University Center for History, Politics, and Policy in Union, N.J. A former member of the New York Times Editorial Board and currently a columnist for the Irish Echo, he is the author of several books, including, For the Cause of Liberty, a History of Irish Nationalism; Irish Rebel, a biography of the Irish-American journalist John Devoy; The Irish in America, the companion book to the PBS series in 1997; Let Every Nation Know, a study of John F. Kennedy’s speeches, co-written with Robert Dallek; and So Others Might Live, a history of the Fire Department of New York City. Joseph McBride is an internationally renowned film historian and biographer who has published fifteen books on film, including one appearing in February 2012 from Vintage Books, Writing in Pictures: Screenwriting Made (Mostly) Painless; it will also be published in March by Faber and Faber, London. McBride’s other books include the acclaimed biographies Searching for John Ford, Frank Capra: The Catastrophe of Success, and Steven Spielberg: A Biography. The Spielberg book, first published in 1997, was updated by McBride for publication of a new edition last year by the University Press of Mississippi, which also published reprints of his Ford and Capra biographies. Searching for John Ford has been hailed as the “definitive” biography of the great Irish American director by both the New York Times and the Irish Times. James Silas Rogers is editor of After The Flood: Irish America 1945-1960, a volume of essays examining diverse aspects of the Irish-American community during the postwar years. He is also editor of New Hibernia Review: A Record of Irish Studies, and a past president of the American Conference for Irish Studies (ACIS). He is the author of articles on Irish-American history and literature in US Catholic Historian, Studies and New Perspectives on the Irish Diaspora), and the director of Irish Studies at the University of St. Thomas in Minnesota. Jack Foley is an innovative, widely-published poet and critic who, with his wife, Adelle, performs his work frequently in the San Francisco Bay Area. He has published eleven books of poetry, seven books of criticism, and a book of translations of the French singer/songwriter, Georges Brassens; he has also edited All: A James Broughton Reader and The “Fallen Western Star” Wars, a collection of responses to an essay by Dana Gioia. Since 1988, Foley has hosted a poetry radio show on Berkeley station KPFA. His column, “Foley’s Books,” appears in the online magazine, The Alsop Review, and he is a Contributing Editor of Poetry Flash. Foley’s recent, monumental Visions & Affiliations: A California Literary Time Line 1940-2005 has received international attention with reviews in both England (TLS, Beat Scene) and the USA. 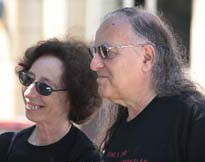 On June 5, 2010, Foley received the Lifetime Achievement Award from the Berkeley Poetry Festival, and June 5, 2010 was proclaimed “Jack Foley Day” in Berkeley. A special thanks to the Friends of the San Francisco Public Library for their support of this event. Electrifying button accordionist, Andrew Mac Namara, playing his unique style of traditional Irish music. Andrew Mac Namara’s individual style of playing traditional Irish music is both true to his heart and to the area in which he was reared. He was born in Tulla, Co. Clare, learning the strong traditions of East Clare music from older players such as Joe Bane and Bill Malley. In his late teens he joined the highly esteemed Tulla Ceili Band in which he toured both nationally and internationally for a number of years. He was a founding member of the group Skylark and recorded two albums with them before forming his own band called The Lahawns. We gratefully acknowledge the support of Culture Ireland for this tour. Crossroads 2012 partnered with the California Historical Society to highlight a piece of San Francisco’s own past in “The History of the Irish Coffee at the Buena Vista Café,” a presentation by Elizabeth Creely. 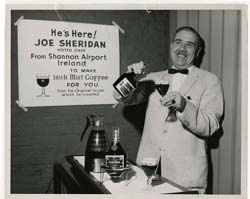 The California Historical Society shares its Buena Vista Café collection to reveal the story of Irish Coffee, a true Irish-American invention. The Buena Vista Café collection received by the California Historical Society in 1982 chiefly contains correspondence and clippings, plus a few photographs, documenting the introduction of Irish coffee to San Francisco. Original letters between Jack and Josephine Koeppler, proprietors, the Irish Consul in San Francisco, and various firms and whiskey distributors in Ireland, as well as correspondence from San Francisco Chronicle columnist, Stan Delaplane, begin in February 1954 and continues well into the 1970s with publicity and articles extolling the fame of Buena Vista’s famous Irish coffee. This event was co-sponsored by the MFA in Writing Program at the University of San Francisco. Crossroads was proud to present the winner of the 2nd Annual Crossroads Irish-American Writing Contest in Short Story. The aim of this contest was to support and develop the voices of Irish-American writing. The event also provided an “open mic” opportunity for writers in the community to read from their short story work which engages with the meaning of an Irish-American heritage. We offer a special thanks to our review panel, Catherine Brady, Academic Director of the Creative Writing Program at the University of San Francisco, Jean McGarry, Professor in the Writing Seminars at Johns Hopkins University, and Terry Winch, author of five books of poems and two story collections. Audiences enjoyed an evening of exploring Irish-American poetry through the voices of three esteemed local poets. This is the second event in a series held at The Meridian Gallery by Irish-American Crossroads in celebration of the art exhibit of Irish painter, Patrick Graham. Terry Ehret is a poet and teacher, one of the founders of the innovative Sixteen Rivers Press, a hands-on publishing collective run by and for San Francisco Bay Area Poets. She has published four collections of poetry, most recently Night Sky Journey from Kelly’s Cove Press. Literary awards include the National Poetry Series, California Book Award, Pablo Neruda Poetry Prize, Nomination for the Northern California Book Reviewer’s Award, and five Pushcart Prize nominations. From 2004-2006, she served as the poet laureate of Sonoma County where she lives and teaches. Gerald Fleming’s poetry and prose poems have appeared widely over the past thirty years. He has won numerous awards and fellowships, and between 1995 and 2000 he edited and published the literary magazineBarnabe Mountain Review, whose archives can be found at U.C. Berkeley’s Bancroft Library. His book of poemsSwimmer Climbing onto Shore was published in 2005, and a book of prose poems, Night of Pure Breathing, appeared last spring from Hanging Loose Press in New York. He taught in the San Francisco public schools for thirty-seven years, and has published three books for teachers, the most recent of which is Rain, Steam, and Speed(Jossey-Bass/Wiley). He lives in the San Francisco Bay Area. A new book of longer prose poems, The Choreographer, is due out in spring of 2013. Laura Moriarty’s books include A Tonalist an essay poem from Nightboat Books, the novels, Cunning and Ultravioleta. A Semblance: Selected and New Poems, 1975 – 2007 came out from Omnidawn in 2007. Who That Divines is forthcoming from Nightboat Books. She is the author of ten other books of poetry going back to 1980. She won the Poetry Center Book Award in 1983, a Wallace Alexander Gerbode Foundation Award in Poetry in 1992, a New Langton Arts Award in Literature 1998 and a Fund for Poetry grant in 2007. She has taught at Mills College and Naropa University, among other places, and is Deputy Director of Small Press Distribution. For more, see the blog A Tonalist Notes. This event featured David Emmons, Professor Emeritus of American History at the University of Montana, Matthew Jockers, Lecturer and Academic Technology Specialist, and James P. Walsh, Professor Emeritus of History at San José State University, in conversation with Margaret Mc Peake, Instructor of Interdisciplinary Studies and Writing at the University of San Francisco and Co-Producer of the 9th Annual Crossroads Irish-American Festival. Dave Emmons’ principal area of teaching, research, and writing is the history of American immigration, particular that of Irish Catholics. In 1989, the University of Illinois Press published The Butte Irish: Class and Ethnicity in an American Mining Town which won both the Robert G. Athearn Prize of the Western Historical Association and Honorable Mention for the James Donnelly Prize given by the American Conference for Irish Studies. In 2010 Emmons published Beyond the American Pale: The Irish in the West which was also awarded an Honorable Mention runner-up prize by the ACIS. His current project, very tentatively titled Ireland in America: The Intersecting Lines of Irish and American History, 1845-1940, will deal with the various ways Ireland’s and America’s histories influenced one another. He lives with his wife Caroline Dollard Emmons in Missoula, Montana–120 miles northwest of Butte, along with San Francisco, one of Irish-America’s two western capital cities. Matthew Jockers is a Lecturer and Academic Technology Specialist (ATS) in the Department of English at Stanford. His research and teaching is focused on Irish / Irish-American literature of the 19th and early 20th-century and on a computational approach to the study of literature that he calls “macroanalysis.” Jockers has written extensively about Irish-American writers from the American West, and some of his recent publications include articles about Irish writers in Kansas, Montana, and California. Jockers’s book, Macroanalysis: Digital Methods for Literary History is forthcoming from the University of Illinois Press. The book includes chapters discussing and analyzing Irish and Irish-American literature. 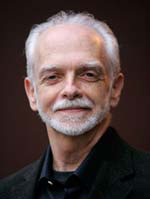 James P. Walsh is Emeritus Professor of History, San Jose State University, where he completed a 35 year career in teaching, scholarship, and academic administration. Through those decades he enjoyed frequent teaching and research appointments to campuses of the National University of Ireland. Dr. Walsh remains active in his field –United States History. This is the third event in a series held at The Meridian Gallery by Irish-American Crossroads in celebration of the art exhibit of Irish painter, Patrick Graham. Renee Gibbons was born in a Dublin tenement in the middle of the 20th century. At 17 she escaped to Paris with the help of a Hollywood actor and a kind stranger. Always restless and full of dreams she spent years searching for the meaning of life and what role she was meant to play in it. She has worked at 30 different kinds of jobs including model, courier, photographer, pre-school teacher and retail buyer and has spent time in more than 150 countries. While traversing the Panama Canal on a ship bound for Egypt with her year-old daughter Ashling, she met and fell in love with a radical longshoreman from San Francisco. For the next three decades that Bohemian city became the base for her world travels and her life as a writer, actor, singer and peace activist. A former columnist for the Irish Herald she lives in North Beach with her husband and cat. Her memoir ‘Longing for Elsewhere’ explores the themes entangled in her journey: identity, adventure, creativity, the burden of history and the passion for justice. Audiences once again enjoyed the chance to honor and celebrate the voices and contributions of the 1950s generation of Irish immigrants to the San Francisco Bay Area. In this event, individuals from the Crossroads Irish Oral History Archive of the San Francisco Bay Area told their stories, in their own words. The Irish-American Crossroads Festival is creating the first-ever oral history archive of the Irish and Irish-American communities of the Bay Area. This oral history project is composed of audio and video recordings of individuals telling their own stories about their own experiences of emigrating to or growing up in the Bay Area. This is the fourth event in a series held at The Meridian Gallery by Crossroads in celebration of the art exhibit of Irish painter, Patrick Graham. 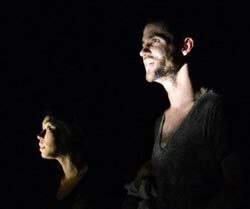 “Yours and Mine” was an original dance performed by choreographer Macklin Kowal at the Meridian Gallery. It was the closing event of the 9th Annual Irish-American Crossroads Festival. Macklin, an Irish-American choreographer, was the Dancer In Residence at the Meridian and performed a dance choreography inspired by Patrick Graham’s work, specifically responding to Graham’s depictions of the human form. Kowal’s performance was a study in embodied empathy. Macklin Kowal (Choreographer) is a performer and performance maker currently based in Oakland. A San Francisco native, he is an alumnus of the city’s School of the Arts, and San Francisco State University, as well as of l’Universite de Paris VIII Vincennes-Saint-Denis. His approach to making performance has been shaped by formative experiences under the direction of Marina Abramovic, Minna Harri, Ann Magnuson, Prumsodun Ok, and Tessa Wills. Active in San Francisco’s contemporary dance/performance scene since 2009, Kowal’s work has been presented by the Garage, the Home Theater Festival, Zero Performance’s Too Much! A Queer Performance Marathon, the San Francisco Art Institute. Crossroads was pleased to partner with the Meridian Gallery to explore and celebrate this exhibit, a survey of over 30 years of work. Curated by Peter Selz. In a rare opportunity to view the works of Ireland’s most influential contemporary artist, Meridian Gallery displayed over 35 works by the artist Patrick Graham, including paintings, collages, and drawings. This exhibition contains four of his monumental iconic diptychs. Two of these pieces, Wreath and Somewhere Jerusalem, evoke the sense of ceremony, ritual, and a longing for space and homeland. Graham has always created meditations in the form of landscapes and iconic imagery that touch upon questions pertaining to reality, the meaning of life, and the search for faith in a world of diminishing absolutes. The Crossroads Festival partnered with the Meridian Gallery to co-present other artists whose work and themes resonate with those of the paintings by Patrick Graham. See details of these events listed above.